Seminary Spotlight is a feature in the Religious Institute’s newsletter Sexuality: From the Seminary to the Sanctuary. Each edition, we ask a different scholar the same six questions about their work at the intersection of religion, gender, and sexuality. This edition we interview Dr. Monique Moultrie. Appreciating God’s gift of sexual freedom, honesty, and responsibility. I learned way too little and way too much in religious spaces about sexuality. In my religious spaces, I learned that young girls and women had different rules for engaging their sexuality than did boys and men. I was implicitly taught that God expected more from women. They were to control their bodies (e.g. be celibate and in essence prevent the sexual urges of others). I was taught that heterosexual marriages were privileged over other relationships because the “Bible said so,” and I was encouraged to see heterosexuality as God’s plan for humanity. I was taught that following sexual passions could lead one away from God’s purpose. Simultaneously I learned that our bodies are fearfully and wonderfully made and that my body/my virginity was a gift that I should freely give to another. I learned to appreciate my body and burgeoning sexuality as a precious commodity. In a way, I learned my first lessons about sexual agency and consent in churches, as I was encouraged to advocate for myself, to actively think about my sexuality and how I wanted to engage others, and to honor my commitments to myself and my God. As a scholar and a teacher, I have spent many years undoing some of what I was taught as a young Christian. I learned about reading the Bible in context and how to wrestle and question with the text. I now teach students ways to interpret concepts with awareness of their biases and preferences. I instruct them in listening and learning from the margins to see for themselves how different contexts lead to differing opinions. In my classrooms, I hope to give students the space to be inquisitive, to question their norms, and to find an ethic that feels authentic for how they want to live and be in the world. What do you wish every undergraduate student knew about religion and sexuality? I wish every student knew that there are very few black and white scenarios. We create our values and norms in many shades of gray. Just as there is no one way to be Christian or to be religious in general, there is not one way to think about sexuality. I personally believe and teach about continuums and how most of our lives are spent in various places on the continuum. My goal is to remind students to stay open to new possibilities of interpretation, new value centers, and new understandings of God and sexuality. I also wish for each undergraduate to gain the skills to be sexually honest and responsible with their faith and religion (if they have a religious preference). How have your students challenged or surprised you in conversations about religion and sexuality? Students have a curiosity and eagerness to understand that has pushed my thinking on topics of religion and sexuality. Just when I think I have something figured out a student’s question will take me back to the drawing board! Students have also challenged me to “practice what I preach” (e.g. to have my scholarship match what I am teaching them in classrooms and vice versa). For years I have worked as a Safe Zone trainer in public arenas, and when students visit my office, they see rainbow flags and events advocating for LGBTQI members. Yet, my syllabi were pretty neutral on the issue of same-gender attraction. Students noticing this disconnect from my office to my classroom encouraged me to recently begin explicitly including some of these knowledge areas into my introductory courses. As you know, our newsletter is called “Sexuality: From the Seminary to the Sanctuary.” Much of your formation as a scholar happened while you journeying through divinity school spaces, and you have gone on to share your teaching gifts primarily in undergraduate classrooms. Tell us more about how you came to make that vocational decision. From being an undergraduate religion major to earning an MTS and PhD, I was chasing answers about religious messages about sexuality. Vocationally, I wanted to make a difference in what messages women received about their bodies and their sexuality from religious communities. One avenue for this vocation is through education. At my core, I believe in undergraduate education and see this as the hope for our future. Getting students who are open and curious to rethink their traditionally held views and perhaps open them up to new possibilities has been immensely rewarding. I like the challenge of undergraduate teaching when students are willing to admit that they may not have all the answers. I try to spark the same fires of intrigue that occurred while I was an undergraduate. As a community speaker, I feel my passion fuels my speaking truth to power and advocating for reproductive justice and agency for all. This intent is fused into my courses and has often been the most received from undergraduate students. How do you help undergraduate students make connections between what they are learning in your courses and their practical lives? Every course I teach has a connection between what students learn in my classroom and how they can apply this in their everyday lives. Sometimes, I model this with the examples I present in my lectures; other times, students rehearse this skill through assignments that are meant to tie course themes into conversation with popular media, news, or local communities. One of my goals is to have education transform students’ lives and to do so it must be useful outside of my classroom. I want students to bring my materials to their hair salons, train rides, family dinners, and yes, even church meetings. When they can wrestle with these concepts without my prompting and look at something that they took for granted with a new lens of interpretation, I feel that we have accomplished something as co-learners. Book, activity, or article you love to teach when addressing religion and sexuality: I assign a section from Daniel Helminiak’s The Sin of Sodom and a section from Kelly Brown Douglas’ Sexuality and the Black Church every semester and have students tackle the various perspectives the authors present. We may do a debate or a reading response paper or just have a class discussion on the reading but it is really important to take a story and tradition that many of them are familiar with and to look at from differing vantage points. What you’re currently reading: Page Proofs of my book: Passionate and Pious: Religious Media and Black Women’s Sexuality (Durham: Duke University Press, December 2017) and Katherine Franke’s Wedlocked: The Perils of Marriage Equality: How African Americans and Gays Mistakenly Thought the Right to Marry Would Set Them Free (New York: New York University Press, 2015). 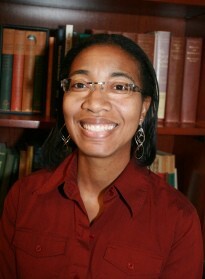 Dr. Monique Moultrie is a womanist ethicist and Assistant Professor of Religious Studies at Georgia State University. Her scholarly pursuits include projects in sexual ethics, African American religions, and gender and sexuality studies. She lives between Atlanta, GA and Nashville, TN with her partner Rev. Eugene Se’Bree and step-daughter Chandler Davis.